A sterling silver band is adorned with cultured freshwater pearls and braid motifs in this meditation ring from Neetu Barathi. Two spinning bands of copper and brass add color and detail to the unique meditation ring. 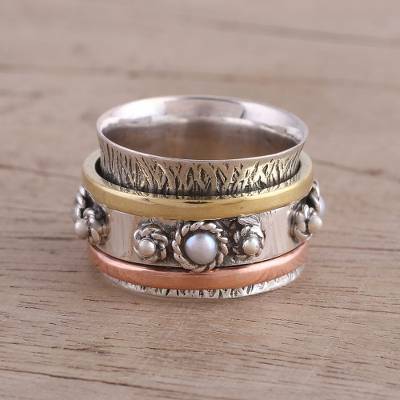 You can find cultured pearl meditation spinner ring 'Spinning Blossom' by Neetu Barathi in jewelry categories such as Birthstone Rings, Pearl Rings, PEARL Cultured Rings, PEARL Freshwater Rings, Silver Rings, Sterling Silver Rings, Brass Rings, Copper Rings, Band Rings and Meditation Spinner Rings. Enjoy exploring these sections for other Novica treasures. The ring is lovely, however, the picture on the site must have been enlarged because the pearls, etc. around the ring do not "pop" as much as they seem to in the picture. They are pretty small. Otherwise, the fit (size 8 for my middle finger) is great and I will wear it often. It is a lovely ring but I was a bit disappointed. Looking at the picture I thought that there were small pearls on each side of the center pearl. Regardless it is pretty and I wear it often.